Over the last three months I’ve been testing the Arc’Teryx Acto FL Jacket and the results are in. Simple and efficient design makes this a great piece as an approach soft-shell for both ice climbing and back-country skiing. Starting in November I wore this jacket on multiple early season ice climbs including the season’s first ascent of Standard Route at Frankenstein Cliffs. I wore it during one of three trips up the Black Dike at Cannon Cliff and on a half dozen ski tours on Mount Washington including one summit day where temps where in the lower teens and winds were 45-65 mph. I’ll go over the details in the order I feel they are most pronounced. The most noticeable feature of this jacket is how well it breathes. The highly air-permeable Aerius™ fabric is no joke. It is difficult to overcome this jacket’s breath-ability even when you are crushing your uphill approach at Munter Rate 6. This level of breath-ability is really important as this “minimalist” piece does not have any side zips for ventilation. It does not need them. As is common with soft-shell style jackets this piece is not water-proof, but has a DWR (Durable Water Repellent) finish. I found this to be adequate on the early and very drippy first ascent of Standard this past Fall. The second pitch had a steady light shower thing going on and I made it to the end of the pitch with only a little bit of “wet out”. If freezing rain or rain is in the forecast I’d reach for one of my hard-shells, but for cold & active this has just enough water/snow resistance for me. While it is always hard to comment on this after only 2.5 months of testing I can attest that I scummed my way up the chimney section on the Black Dike and bushwhacked though some dense pine trees in Gulf of Slides and on Mount Willard and have yet to put anything on this jacket that shows it has been on some adventures, so I’m going with yes, it is durable and abrasion resistant! I’ll admit I did not read any of the manufacturer’s description before starting my testing. I like to have no preconceptions when I start the review process. So it took me a moment to figure out why sections of the bottom hem felt like they had a four 4 inch long cylindrical foam/gel-like straws sewn into it. This was something I hadn’t seen before it and I think it’s quite an excellent idea. This feature is designed to prevent the jacket from coming un-tucked from your climbing harness when making repeated over the head arm-stretches (ice climbing). It is an elegant and effective design choice and one I think will appear on many technical soft-shells that are specific to wearing under a harness. In keeping with the fast & light minimalist design the jacket only sports two high “cross over” hand/chest pockets. The few times I wore this jacket casually I missed hand pockets but that’s not a fair dig as this is not a jacket designed for casual wear, it’s designed for sending it in the mountains at a quick clip! Arc’teryx did make a clever design choice with the hood changing the material here to lightweight Tyono™ 30 nylon StormHood™. This material is less breath-able than the main material used in the jacket but much more wind-resistant. The informal “try to blow through the fabric” test makes it seem twice as wind-resistant than the main material. The hood fits perfect without a helmet on, which leads me to one of my only negative marks on the jacket. The hood is really a tad snug when worn over a helmet. If you have a low profile helmet like the Petzl Sirocco or Black Diamond Meteor III it would probably work, especially if you are a small or medium sized helmet vs my XL sized melon. I do like the stiffened visor when wearing it without a helmet though! Following the Arc’teryx size chart I went with a size large based on my 42 inch chest. Other than the hood being snug when wearing a helmet the arm and waist cut felt great. I would layer my Merino wool t-shirt and a light fleece or wool hoody under the jacket. I could easily put my big puffy belay jacket over this when needed. I especially liked the snug elastic wrist cuffs that kept both spin drift and occasional drips running down my arms. Arc’Teryx listed this at 440 g / 15.5 oz. My home scale on my size large weighed in at 490 g / 17 oz. This puts the jacket towards the heavier side of “minimalist” jackets but I’m not sure that could be helped given the base fabric used. I’d take the a few extra ounces for the amount of comfort-range this piece affords. While the jacket isn’t super pack-able I haven’t really had a reason to not be wearing it during day missions. Arc’teryx designed this jacket as a minimalist piece for fast & light missions alpine missions and while not the end-all-perfect piece the Arc’Teryx Acto FL Jacket comes darn close to perfection. While I would like to see the hood enlarged a little bit there’s really not much I would change given the end-goal. If you are in the market for a super-breathable rugged soft-shell give this one a look! A media sample was provided for purpose of review. Affiliate links help support the content created here. Thank you! The Outdoor Research Alpine Down Hooded Jacket is an excellent choice for a goose down belay jacket at an competitive price. I’ll go into some details in a moment but I must say I had a little bit of reverse sticker shock having spent a dozen days testing this jacket before sitting down to write about and discover that it retails for $349.95. Ethically sourced 800 fill goose down with high performance shell fabrics and mapping? Backed by Outdoor Research’s amazing Infinite Guarantee? How did they pull this off? Let’s get into the details and find out if this is a piece for your winter adventure kit! Your new trusty 6000 meter puffy, The Alpine Down Hooded Jacket is loaded with the durability, weather resistance, and warmth to withstand high altitude’s howling wind and biting cold, yet still stows away snugly by packing into its own left-hand pocket. Pertex® Quantum Pro provides beefy durability on the shoulders, sleeves, and hood, while the lighter-weight body traps the insulating powers from 800-fill responsibly sourced down in a baffled construction that eliminates the cold spots notorious to fully-quilted jackets. Brimming with feature-packed details like Dynamic Reach™ Underarm Panels, elastic drawcord hem and cuffs, pocket placements that don’t interfere with your harness, and a helmet-compatible halo hood, the Alpine Down doesn’t compromise on functionality, or exceptional warmth. I started testing this jacket during the snowiest and coldest October in twenty years on Mount Washington and throughout the White Mountains. I used it on multiple early season ice climbs at Frankenstein Cliffs and two trips up the iconic Black Dike on Cannon Cliff in November. I also used it while teaching a mid-December avalanche course in Gulf of Slides on Mount Washington. All in all I put about 12 solid days behind forming my opinions on the jacket. Warmth– At this price point I have tested few jackets that felt as warm as this piece does. Outdoor Research stuffed this piece with 182 grams (6.42 ounces) of 800 fill power goose down with a baffled construction to eliminate cold spots. While not quite as toasty as my Patagonia Fitz Roy Parka this jacket comes in about $100 cheaper! Water Resistance– The main torso shell material is Pertex Quantum Y shell treated with a Durable Water Repellent (DWR) finish which gives decent water resistance. Slightly more durable Pertex Quantum Pro makes up the sleeves and hood. I only encountered frozen precipitation during my testing and if liquid precipitation is in the forecast I usually reach for my heavier bombproof synthetic belay jacket, the Outdoor Research Perch Belay Jacket. Wind Resistance– I summited Mount Washington in 50-65 mph winds and felt this piece is pretty much wind-proof. Any jacket of this construction would typically be considered windproof so no big surprise there. Breath-ability– Another high mark this piece breathes excellently due to it being a down jacket with high end shell construction. No issues at all with breath-ability. Weight/Pack-ability– My home scale weighed this piece about three ounces heavier than the claimed weight (19oz / 538g Avg weight for size L). My size large weighed in at 22oz / 634g. The left front hand pocket zipper is reversible so that you may stuff this into it’s own pocket. It fits the inside-out pocket with out to much fuss and the resulting pack size is about 12 inches by 5 inch football shaped “pillow”. Sizing/Fit– I found this to fit true to size with a large easily fitting over my active climbing layers at the belay with some room to spare. The “halo” hood easily fit over my climbing helmet and has a three part draw-cord system to help it stay in place so you can keep that important peripheral vision! While the hand pockets are positioned a bit high to “not interfere” with a harness I’ve never tucked in this style of jacket into my harness before so I feel that is a moot point. This goes over “everything”. Stick to the size chart when ordering. Minutia– Two nice big stretchy internal pockets provide a good spot for drying my technical ice climbing gloves or holding a water-bottle. There’s an internal zipper “media pocket” with port but I tend to keep my iPhone in a closer to skin layer anyways so I didn’t really use this. Tricot brushed fleecy collar is super comfy when zipped up in my cocoon. Articulated underarm panels allow full overhead reaches without lifting the bottom of the jacket to high. Bottom up zipper is nice for easier access to belay device. In the field of 800 fill hooded down belay jackets the Outdoor Research Alpine Down Hooded Jacket is a strong contender. Enough down was used to make this feel like the warm puffy a true belay jacket should. The quality of the shell fabrics and mapped construction are impressive given the price range was kept to the below $400 level. Using some hydrophobic down would really have made this a stand-out but I could see that increasing the manufacturing cost to the next level so… at the price I have yet to see a full down belay jacket of this quality that is also backed by one of the greatest warranties in the industry. For true cold New England or high altitude conditions it would be hard to go wrong with this piece. A media sample was provided for review. Affiliate links support this blog. The first avalanche course of the season with Northeast Mountaineering wrapped up yesterday late afternoon after 3 solid days of mixed classroom and field sessions. We have an awesome new classroom venue just minutes from The Bunkhouse and we were stoked to have so much snow on the ground for the first course of our season. After a morning of classroom on Friday we spent the afternoon outside learning and practicing avalanche rescue skills. On Saturday we spent a little time learning how to PLAN a tour in avalanche terrain before heading up to Hermit Lake on Mount Washington for some practice monitoring conditions along our tour. On Sunday we started with a student led trip planning session at Pinkham Notch Visitor Center. We then skinned up the Gulf of Slides Ski Trail. Great weather for our full tour day! Found some thin and stubborn pencil hard wind slab on this 37 degree slope at 4,500 feet to lookers left of the Main Gully. You can also see the December 3rd Melt-Freeze crust about 50 cm down here. Edge-able, ski-able, but we are glad to see more snow in the forecast! All in all it was a fantastic start to the avalanche course season with Northeast Mountaineering. The new curriculum rolled out pretty smoothly and I am digging the new “AIARE Framework” that creates a slightly smoother “flow” of decision making then the classic “Decision Making Framework” some of you may be familiar with. The new organization of the Avalanche and Observation Reference Tool is pretty sweet, and I really like the new 2-3 hour pre-course online learning component! 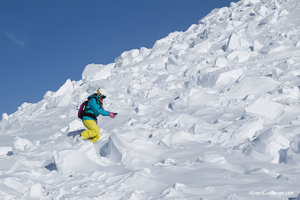 If you have been waiting to take an avalanche course I’d say you should wait no longer! Most providers in the area are seeing courses sell out quite regularly! You can see what dates we have left here!